Standing 5’7, with short blonde hair, senior Savanna Fuller (‘19) steps onto the tennis court with demeanor and determination every day of the week. One of the main characteristics necessary for student-athletes is the ability to show an increased amount of self-discipline. This is how athletes can contribute the most to their teams. 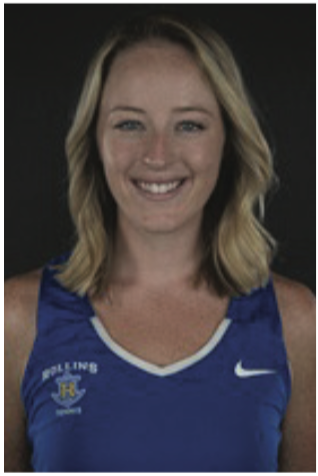 This discipline is embodied in Fuller, as is a tremendous amount of enthusiasm to discuss the Rollins women’s tennis team and her overall passion for the sport. “I think I’m a leader in trying to always keep a very positive attitude. Sometimes it’s hard to practice day in and day out, and I feel like I do a good job of keeping spirits up when we don’t feel like being on the court,“ she said. Fuller has been playing tennis since she was 3 years old, following in her grandmother’s footsteps. She and her now 80-year-old grandmother still play tennis together and remain personally connected to the sport. “To my family, tennis is something that we can do together. We all have different interests, but tennis is the common thread that we can all enjoy,” Fuller said. Fuller hopes to improve both her personal record of 10-9 overall last year and the team’s record of 13-9. “My record has always been reasonably good, as our conference is one of the toughest in the nation. We try to do our best every year, so my record could always be improved but I’d really just like to play well more than even winning,” she said. Making time for her teammates outside of practice not only improves the team dynamics but requires time management and flexibility, as student athletes often have to sacrifice a big part of their social calendar. To be successful, many student athletes aim to become just as well-rounded as Fuller. As a political science and international relations double major, Fuller has been juggling her responsibilities successfully for four years and is looking to attend law school after she graduates in May. At this point in the year, in what is considered the tennis team’s off-season, the players have practice five days a week, in addition to morning workouts. This dedication has been led by Coach Beverly Buckley for 31 years. Buckley herself played for Rollins during the 1970s. She has appointed Fuller as one of the leaders of the senior team because she noticed the player’s strong will and devotion to the team. The team does not have captains. “I would say she cares for us all individually as people, and that is her priority: making sure we are mentally okay first,” said Fuller when asked about the player-coach dynamic. Putting energy into these challenging tournaments takes a competitive edge and hard work. Last year the team placed 20th in the conference and is training hard to improve that record by cultivating more self discipline. As a disciplined player, Fuller insists that her nutrition heavily contributes to her ability to play. While living off campus, she makes it a priority to prepare her meals and tries to be as healthy as she can without a meal plan. As a competitive athlete, Fuller differs somewhat from other students living on campus. But she successfully manages her health, studies, and social life. The women’s team is more than excited to see what the future holds for Fuller in her final year. Fuller hopes to compete in smaller leagues in the future and continue to play tennis passionately and with commitment. The women’s tennis team competes next Friday, Oct. 26 in the Juan Varon Memorial Invitational at Daytona Beach. Wish them luck and stay up to date with upcoming tournaments by visiting rollinssports.com and using the hashtag #tarnation.